Who would you rank as the best PvP class? Having returned to World of Warcraft over the last few months, I admit to spending more time playing PvP than leveling. That was always the case when I played the game, and it’s evident little will change this time around. Having worked with my guild - made up of many seasoned PvPers - alongside Max and John at Ten Ton Hammer, we’ve pulled together a list of the top five PvP classes. We’re not suggesting those not on this list aren’t viable or fun, but we feel these five are particularly potent, regardless of the PvP mode you play. Mage's have always been strong, and in Battle for Azeroth, they're no different. Arcane, and Frost in particular, remains frustrating. 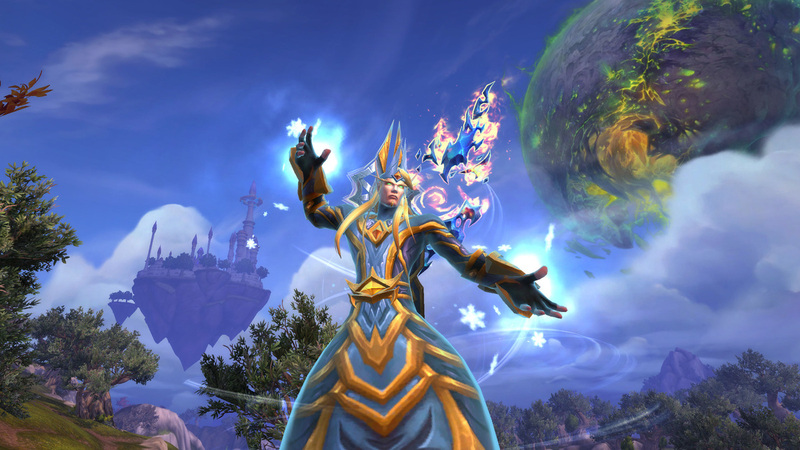 Typically Arcane or Frost, Mages have always been incredibly potent in World of Warcraft. In Arena, the Rogue/Mage/Priest composition remains top-tier and there’s little wonder why. With access to bags of crowd control, utility and damage, a skilled Mage is not only difficult to pin down, but also more than capable of cutting through opponents. Polymorph, Ice Block and Blink are all frustrating to deal with, while Prismatic Barrier (Arcane) or Ice Barrier (Frost) ensure even greater sustain. Like any cloth wearer, a Mage can be killed quickly but getting them into that corner means exhausting the majority of their kit, a task that’s not particularly easy. Whether you choose Mistweaver or Windwalker, the Monk is an incredibly potent class. While I’d argue that they excel far more in Arena than Battlegrounds (the open field tends to see them cut down quickly by multiple ranged opponents), that doesn’t mean they’re easy to deal with. Where the Windwalker is concerned, they deal consistently high damage while armed with bags of crowd control. A knockdown, a stun, slow, root, and importantly, a powerful heal reduction in Rising Sun Kick makes them incredibly potent in small skirmishes. Even the Mistweaver, while arguably a touch weaker than the Restoration Shaman, is still super strong. Life Cocoon, Soothing Mist and Vivify offer bags off efficient sustain, while Revival is effectively a restart on any team fight. The Terminator of World of Warcraft, Discipline Priests right now are, to be blunt, fairly ridiculous. In lower levels they’re almost unkillable, and in higher levels, they prove just as challenging. A low cooldown on Powerword: Shield, combined with Pain Suppression and Atonement ensures that they’re not only incredibly difficult to bring down, but they’re also free to keep their team alive with relative impunity. Few compositions can adequately deal with a Discipline Priest, ensuring that they are - unfortunately - often a mandatory draft in Arena or Battlegrounds. The kings of 1 on 1, Rogues have always been an incredible nuisance. A large part of their success comes down to the value of stealth, and the fact there’s very little that players can do to detect them. As is often the case (certainly in a 1 on 1 scenario), a good Rogue will get the jump on you, and proceed to hit you with lengthy crowd control, and high damage. Unfortunately for high value targets, at times it can feel like there’s little you can do to counter such play, and unless you’ve a support class on hand to help you out, at the very least you’re going to suffer a high amount of damage in a short period of time. While Rogues might lack potency in large scale encounters, or when out of stealth, but they more than make up for this in confined spaces or when picking on vulnerable, long players. Despite being recently nerfed, there's no mistaking that Beast Master, Marksman and Survival Hunters are incredibly strong. Irrespective of which spec you choose, they're all powerful in their own right. While Beast Master is undoubtedly the strongest, there's plenty of room for the other two in top tiers. With powerful pets, lots of control through traps and key abilities, Hunters prove challenging to bring down and leathel if left to fire from afar. Disagree with the above list? Let me know why! We'll work together on updating it! Big thanks again go to Screwling, Violence Reborn, Spirit and Dawnstor for helping compile this list. Love you guys!